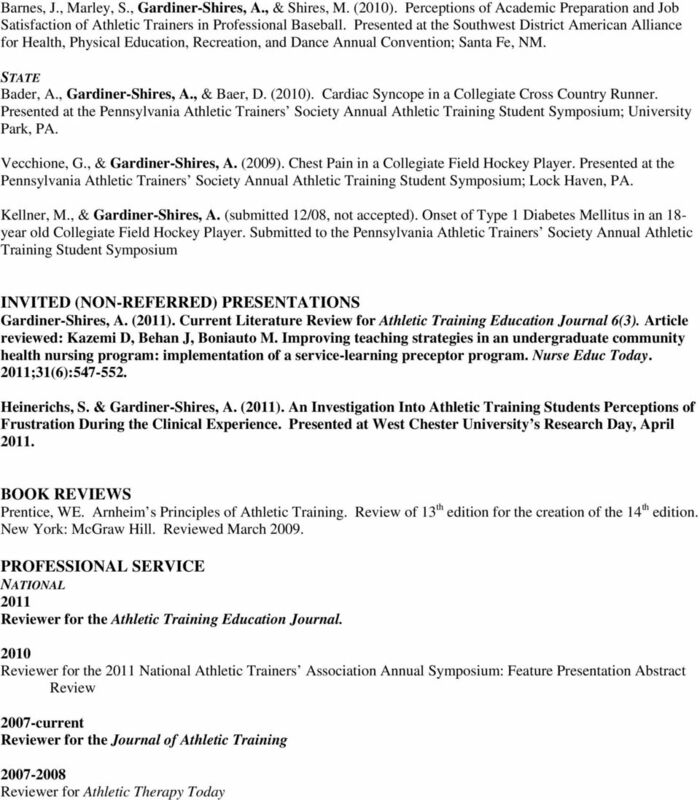 Download "Alison Gardiner-Shires, Ph.D., ATC"
2 Doctoral Graduate Assistant, University of South Carolina, Columbia, SC Football: On-Field Visiting Team Liaison Men s and Women s Cheerleading :Assisted in providing coverage as requested Men s and Women s Tennis :Assisted in providing event coverage as requested Women s Basketball : Assisted in providing weekly coverage as requested Women s Basketball Summer Camp Women s Soccer Summer Camp 2004 Athletic Trainer, Columbia College, Columbia, SC Provided event coverage as requested Interim Co-Head Athletic Trainer, Dickinson College, Carlisle, PA 1 year sabbatical replacement for Co-Head Athletic Trainer. Responsible for every aspect of the sports medicine program including helping to implement a concussion management program. 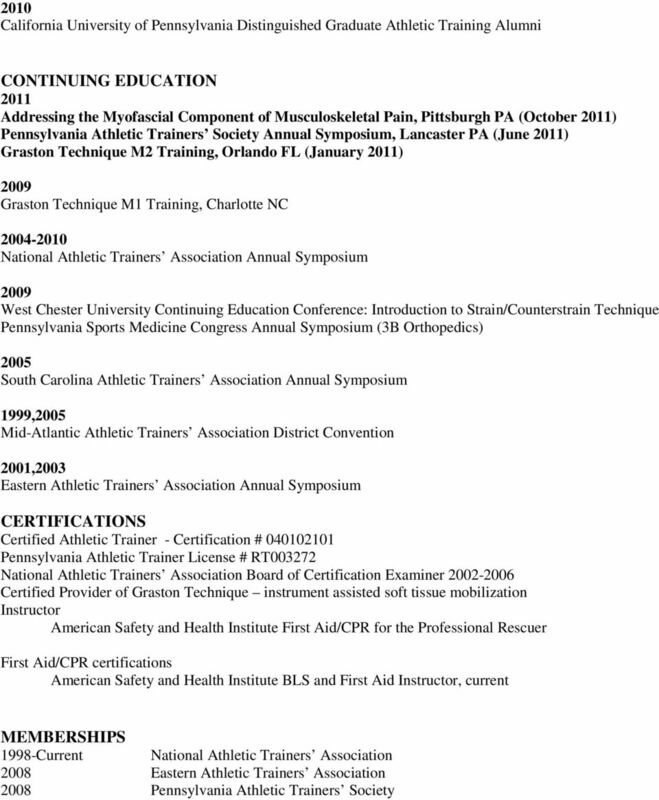 Provided athletic training coverage for 23 NCAA Division III teams. 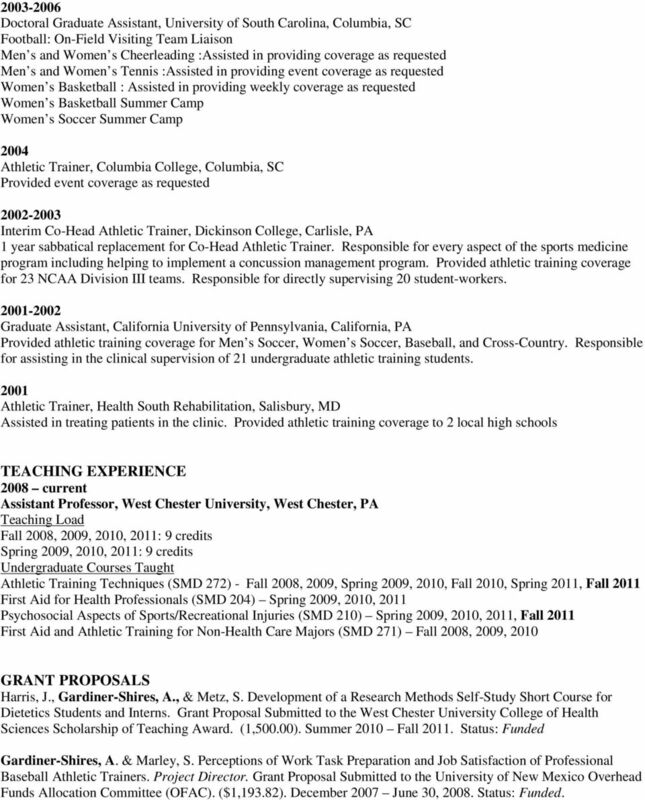 Responsible for directly supervising 20 student-workers Graduate Assistant, California University of Pennsylvania, California, PA Provided athletic training coverage for Men s Soccer, Women s Soccer, Baseball, and Cross-Country. Responsible for assisting in the clinical supervision of 21 undergraduate athletic training students Athletic Trainer, Health South Rehabilitation, Salisbury, MD Assisted in treating patients in the clinic. 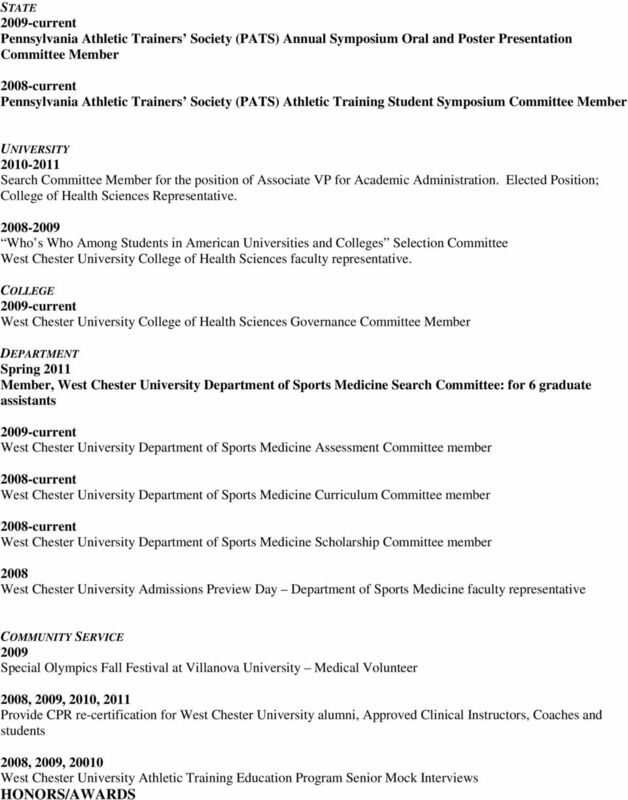 Provided athletic training coverage to 2 local high schools TEACHING EXPERIENCE 2008 current Assistant Professor, West Chester University, West Chester, PA Teaching Load Fall 2008, 2009, 2010, 2011: 9 credits Spring 2009, 2010, 2011: 9 credits Undergraduate Courses Taught Athletic Training Techniques (SMD 272) - Fall 2008, 2009, Spring 2009, 2010, Fall 2010, Spring 2011, Fall 2011 First Aid for Health Professionals (SMD 204) Spring 2009, 2010, 2011 Psychosocial Aspects of Sports/Recreational Injuries (SMD 210) Spring 2009, 2010, 2011, Fall 2011 First Aid and Athletic Training for Non-Health Care Majors (SMD 271) Fall 2008, 2009, 2010 GRANT PROPOSALS Harris, J., Gardiner-Shires, A., & Metz, S. Development of a Research Methods Self-Study Short Course for Dietetics Students and Interns. Grant Proposal Submitted to the West Chester University College of Health Sciences Scholarship of Teaching Award. (1,500.00). Summer 2010 Fall Status: Funded Gardiner-Shires, A. 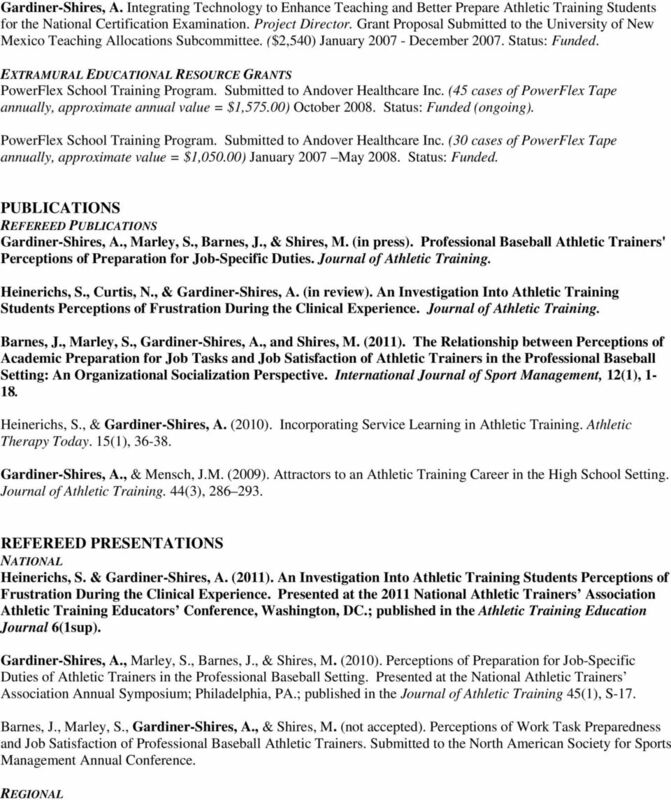 & Marley, S. Perceptions of Work Task Preparation and Job Satisfaction of Professional Baseball Athletic Trainers. Project Director. Grant Proposal Submitted to the University of New Mexico Overhead Funds Allocation Committee (OFAC). ($1,193.82). December 2007 June 30, Status: Funded. AMBER D. PHILLIPS. Education! TEACHING EXPERIENCE! MARK SIEMON, RN, APHN-BC, MPH, MSN, CPH 1628 W. REINHART DR. BOISE, ID 83706 (208) 426-3911 (Office & voice mail) marksiemon@boisestate. 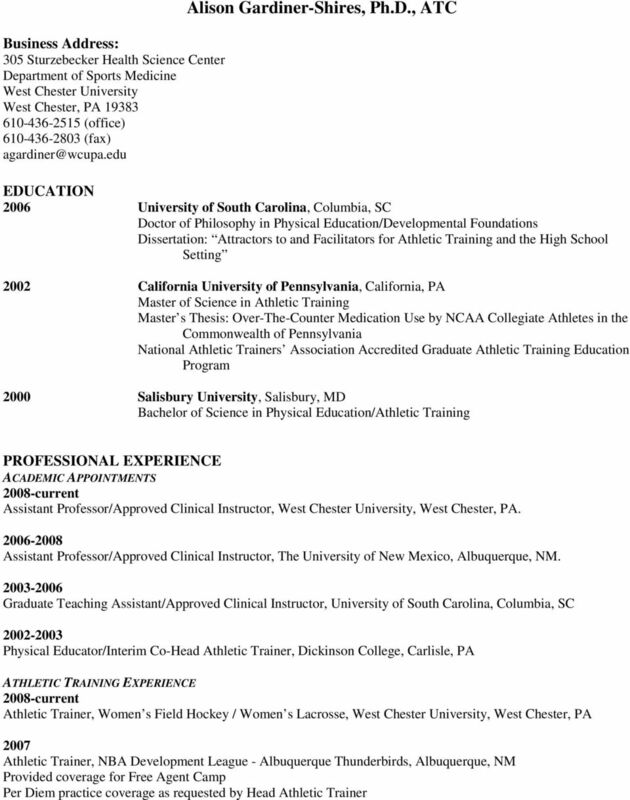 EDUCATION DIANE WHITAKER EBBERT, PhD, RN, ARNP FNP-BC 17970 Leavenworth Road Tonganoxie, Kansas 66086 913 724-2343 (home) 913 588-1649 (office) UNIVERSITY OF KANSAS, SCHOOL OF NURSING, Kansas City, Ks. MARK SIEMON, PhD, RN, APHN-BC, CPH 1628 W. REINHART DR. BOISE, ID 83706 (208) 426-3911 (Office & voice mail) marksiemon@boisestate.